Online advertising is evolving at an alarming rate. Currently there is a shift towards audience based ad targeting as outlined by the eMarketer report. Though when it comes to ad targeting, there is a metric that is often left out of the conversation. This metric is the in-segment incidence. The best way to illustrate this is with the following graphic. Consider each dot to be a delivered impression. Based on the targeting, or lack of targeting, there will be an incidence of a given audience that you will hit successfully (this your target audience). 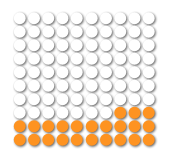 Consider each orange dot an impression delivered to the correct audience. In few cases are you ever successful 100% of the time. With the plethora of data sources available, whether third party or first party, there is little transparency to what the true success rate is of reaching a given audience. Further, there is even less transparency of what the expected success rate is. For instance, there have been some yet undisclosed tests where a segment from the third party data provider Blue Kai experienced an in-segment success rate of 11%. That means that for every 100 impressions, only 11 are reaching the intended audience. Every audience exists in some concentration naturally. Whether it is an audience of wealthy females, or tweeting dads, most publishers will have some natural incidence of finding these individuals on their sites. This may be considered as the base or an index of 100. There is also a distinction between the natural incidence on a particular site, and the Internet Norm. For the purposes of this discussion, we are interested in the incidence on the particular web property. The targeting incidence is just that, the incidence that targeting that audience targeting would provide. In an ideal world, audience targeting would provide an in-segment incidence of 100%, though this is rarely the case, and in more cases, less is acceptable. 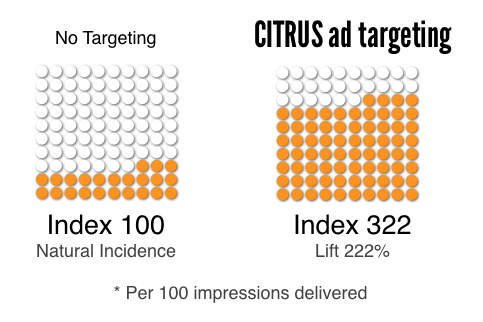 A measure of performance in ad targeting is the lift in reaching a desired audience. More specifically, the percent change of the targeting incidence over the natural audience incidence. Lift plays an important role as it provides a relative improvement. As noted, there is little transparency in the industry around what in-segment means and what acceptable rates are. 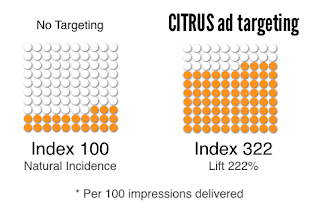 As part of the Crowd Science CITRUS model, a core component is understanding the three concepts above and providing the publisher with the insights on expected performance, which in turn, translates in to value. In my next post, I'll dig in to a few insights around some industry related performance metrics.